Where would you go to find a new species? Well, instead, how about inside Te Papa’s collections, because that’s where I first discovered a new species of Gleichenia tangle fern. 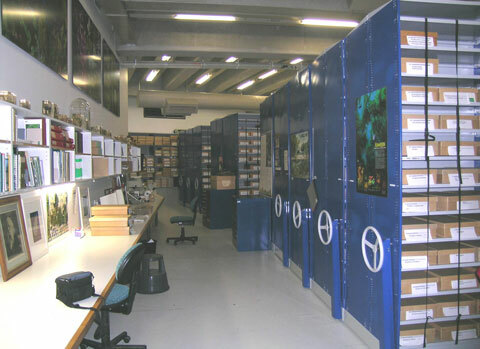 Biodiversity-treasure – inside one of Te Papa’s two botany collection stores. Te Papa has over 250 000 dried plant specimens. Copyright Te Papa. A lot of biodiversity remains to be documented, particularly amongst smaller plants and animals, and micro-organisms. But in a well-explored country like New Zealand, it is uncommon to find a clearly distinct new species of fern or seed plant. Instead, taxonomists like myself spend a lot of time with statistical and/or genetic analyses trying to determine whether similar things are sufficiently different to be classified as separate species. 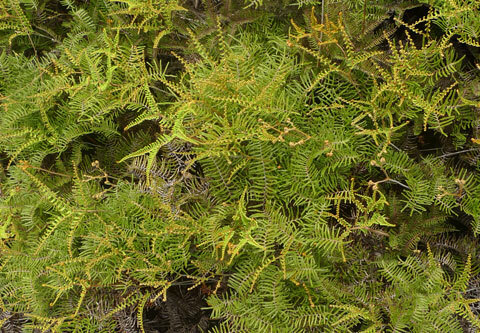 A tangle of tangle ferns – the new species growing intermixed with Gleichenia dicarpa, western South Island. Photo Leon Perrie, Te Papa. You might, then, appreciate my surprise and excitement at finding an obviously different species while inspecting Te Papa’s specimens of Gleichenia. The differences were so great, I thought I was hallucinating. I was using a microscope at the time, but the differences are evident to the naked eye once you know what to look for. I’ve now checked through New Zealand’s three biggest botanical collections – Landcare Research, Auckland Museum, and Te Papa. Between them they hold several hundred Gleichenia specimens, but just 13 of the new species (only 2 of Te Papa’s 250 specimens of Gleichenia are the new species). • how to distinguish the new species from the other species of Gleichenia in New Zealand (and Australia). • where it occurs – it appears restricted to just three regions of New Zealand. • how common it is – apparently not very. This is a clear demonstration of the value of such collections – they document our biodiversity. I knew a lot about this new species without even stepping outside. A paper establishing a scientific name for the new species will be published soon. I’ll then post on how to distinguish the new species. Why has this new species not been detected before? There’s no doubt that tangle ferns are a difficult group, and they’ve probably been neglected. There is still much to learn about the boundaries between the presently recognised species in New Zealand – Gleichenia alpina, G. dicarpa, and G. microphylla – and I’m working on that too. Images associated with some of Te Papa’s Gleichenia specimens. I have a bug that can bite really big like a big piece of wood!!!! !